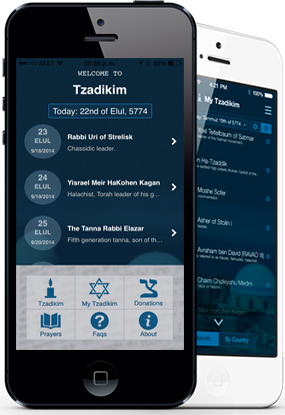 Tzadikim is a free application sponsored with the donations of people around the world. Our goal and focus is to provide you with tools to help you connect to the souls of the Tzadikim and have their support in your prayers. Your	donation	will	go	toward	supporting	the	expansion	of	this	app. We	will	add	more	tzadikim information, pictures	and	features. This	app	is	one	of	the	Daily	Zohar	projects	and	our	goal	is	to	reach and	provide	many	people	around	the	world	with	tools	to	enhance	their	spiritual	connections,	increasing the	presence	of	the	Light	of	the	Creator	in	this	world.